"George Calvert" redirects here. For other uses, see George Calvert (disambiguation). George Calvert, 1st Baron Baltimore ( /ˈbɔːltɪmɔːr/; 1580 – 15 April 1632) was an English politician and coloniser. He achieved domestic political success as a member of parliament and later Secretary of State under King James I. He lost much of his political power after his support for a failed marriage alliance between Prince Charles and the Spanish House of Habsburg royal family. Rather than continue in politics, he resigned all of his political offices in 1625 except for his position on the Privy Council and declared his Catholicism publicly. He was created Baron Baltimore in the Irish peerage upon his resignation. Baltimore Manor was located in County Longford, Ireland. Calvert took an interest in the British colonisation of the Americas, at first for commercial reasons and later to create a refuge for persecuted English Catholics. He became the proprietor of Avalon, the first sustained English settlement on the southeastern peninsula on the island of Newfoundland (off the eastern coast of modern Canada). Discouraged by its cold and sometimes inhospitable climate and the sufferings of the settlers, he looked for a more suitable spot further south and sought a new royal charter to settle the region, which would become the state of Maryland. Calvert died five weeks before the new Charter was sealed, leaving the settlement of the Maryland colony to his son Cecil (1605–1675). His second son Leonard Calvert (1606–1647) was the first colonial governor of the Province of Maryland. Little is known of the ancestry of the Yorkshire branch of the Calverts. At George Calvert's knighting, it was claimed that his family originally came from Flanders (a Dutch-speaking area today across the English Channel in modern Belgium). Calvert's father, (an earlier) Leonard, was a country gentleman who had achieved some prominence as a tenant of Lord Wharton,  and was wealthy enough to marry a " gentlewoman" of a noble line, Alicia or Alice Crossland (or sometimes spelled: "Crosland"). 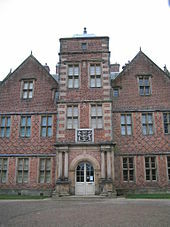 He established his family on the estate of the later-built Kiplin Hall, near Catterick in Yorkshire. George Calvert was born at Kiplin in late 1579. His mother Alicia/Alice died on 28 November 1587, when he was eight years old. His father then married Grace Crossland (sometimes spelled: "Crosland"), Alicia's first cousin. Calvert had a total of thirteen children: Cecil, who succeeded his father as the 2nd Baron Baltimore, Leonard, Anne, Mary, Dorothy, Elizabeth, Grace, Francis, George, Helen, Henry, John, and Philip. In 1606 the king made Calvert "clerk of the Crown" and "Assizes in Connaught", County Clare, Ireland, his first royal appointment. In 1609, James appointed him a "clerk of the Signet office", a post which required the preparation of documents for the royal signature and brought Calvert into close contact with the king. Calvert also served in James's First Parliament as a member for the borough of Bossiney, in the county of Cornwall, installed there by Cecil to support his policies. In 1610, Calvert was appointed a "clerk of the Privy Council". Each of these positions would have required an oath of allegiance. 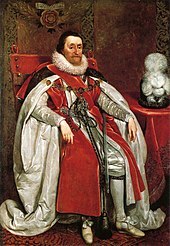 James I, painted by Daniel Mytens in 1621. James made Calvert the first Baron Baltimore in 1625, in recognition of his services to the Crown. When King James I died in March 1625, his successor Charles I maintained Calvert's barony but not his previous place on the Privy Council. Calvert then turned his attention to his Irish estates and his overseas investments. He was not entirely forgotten at court. After Buckingham's dabblings in wars against Spain and France had ended in failure, he recalled Baltimore to court, and for a while may have considered employing him in the peace negotiations with Spain. Though nothing came of Baltimore's recall, he renewed his rights over the silk-import duties, which had lapsed with the death of James I,  and secured Charles' blessing for his venture in the "New Found Land". Aston's return to England in late 1626,  along with all the Catholic settlers, failed to deter Baltimore, who finally sailed for Newfoundland in 1627, arriving on 23 July and staying only two months before returning to England. He had taken both Protestant and Catholic settlers with him, as well as two secular priests, Thomas Longville and Anthony Pole (also known as Smith), the latter remaining behind in the colony when Baltimore departed for England. The land Baltimore had seen was by no means the paradise described by some early settlers, being only marginally productive;  as the summer climate was deceptively mild, his brief visit gave Baltimore no reason to alter his plans for the colony. Maryland became a prime tobacco exporting colony in the mid-Atlantic and, for a time, a refuge for Catholic settlers, as George Calvert had hoped. Under the rule of the Lords Baltimore, thousands of British Catholics emigrated to Maryland, establishing some of the oldest Catholic communities in what later became the United States. Catholic rule in Maryland was eventually nullified by the re-assertion of royal control over the colony. ^ a b c Krugler, p. 28. ^ a b c Browne, p. 3. ^ Krugler, pp. 12–16; From 1571, graduated fines were imposed on anyone attending mass in the Roman Catholic church, and generous rewards were offered to informers of the crime. Middleton, p. 95. ^ a b c d Krugler, pp. 28–30. ^ a b c Krugler, p. 30. ^ a b c d e Krugler, p. 32. ^ a b Browne, p. 4. ^ a b Fiske, p. 255. ^ Browne, p. 4; Krugler, p. 32. ^ a b Krugler, p. 35. ^ a b Krugler, p. 39. ^ a b c Krugler, p. 38. ^ Krugler, p. 38 and p. 83. ^ Browne, p. 8; Brugger, p. 4. ^ a b Krugler, p. 66. ^ "On 16th/26th February, in recompense for past services, King James I appointed Calvert Baron Baltimore of Baltimore, in County Longford, Ireland." 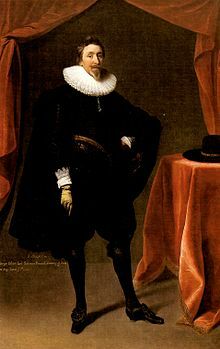 Codignola, 12; In March, Lord Carew wrote: "Calvert is removed from his place as secretary of state, but yet without disgrace, for the king hath created him baron of Baltimore in Ireland, and remaynes a councillor". Krugler, p. 74. ^ Amerigo Salvetti, Tuscan representative in London, wrote in his January–February newsletter "being resolved for the future to live and die as a Catholic, he knew he could not serve him [the duke] where he was without the jealousy of the state and danger from Parliament." Krugler, p. 74. ^ Krugler, p. 69. Abbot's remark suggests previous wavering on Calvert's part; Krugler speculates that the two previous times "he had bene to blame that way" were during his childhood, when his Catholic family was forced to become Protestant, and during the period of distress and doubt Calvert experienced after the death of his wife. ^ "The Sacred Congregation de propaganda fide, officially established by Pope Gregory XV on 22 June 1622, with the papal bull: "Inscrutabile divinae providentiae", had the double mission of spreading the "True Faith" among the infidels and of protecting it wherever Catholics lived side-by-side with non-Catholics. 'Propaganda' was meant to pursue these goals by co-ordinating all missionary activities and centralising information on foreign lands ... on the global chessboard on which Propaganda was operating, England was one of its most difficult problems. ", Codignola, p. 9. ^ Letter of Simon Stock, 15 November 1624 quoted by Codignola, p. 11. ^ Browne, p. 14; Fiske, p. 256; Codignola, p. 12; Krugler, p. 5. ^ The Venetian ambassador wrote "Should this new scheme attain the king's assent, he [Baltimore] will be employed in it, because they consider him to be a staunch Spaniard". But later he wrote, "Because he is so notoriously a Spaniard the king cannot employ him from lack of confidence". Krugler, p. 90. ^ Krugler, pp. 33–4 and 39; He later also became a member of the New England Company which founded the Massachusetts Bay Colony in 1622. Browne, p. 15. ^ Between the modern towns of Fermeuse and Aquaforte. ^ Browne, p. 16; Codignola, p. 10. ^ Browne, p. 16; Wynne promised to send Calvert a barrel of the best salt that ever "my eyes beheld". Krugler, p. 79. ^ When Calvert wintered in the colony in 1628–29, he would write of being deceived by the "lying letters of the Governors and such". Krugler, p. 79. ^ When Nutt was captured in 1623 after switching his activities to the Irish Sea, Calvert had him released, and his captor Captain Eliot imprisoned for malfeasance of office. Krugler, p. 82. ^ Browne, p. 17; Codignola, p. 10. ^ Browne, p. 17; Fiske, p. 256; A Palatinate was a province governed by a semi-autonomous agent in the King's name. Calvert, who had in April 1621, opposed attempts by the House of Commons in the English Parliament to extend their authority to the fishing rights in the "Americas"/"New World", believed that plantations: "are not yet annexed to the Crown of England, but are the King's as gotten him by conquest" governed according to the King's Prerogative, as he saw fit. Krugler, p. 78. ^ Krugler, pp. 75 and 84. ^ Charles accepted Baltimore's refusal with good grace. "His ability to manipulate the government for his own purposes over the next few years belies any suggestion that the government hounded him out of England." Krugler, pp. 85–7. ^ Krugler, pp. 85–86. Aston was granted a royal licence for the voyage in return for bringing back some hawks and elks for the king. ^ Since there is not a record of the marriage, it would certainly have been a Catholic one. Krugler, p. 86. ^ Stock wrote to his superiors that the "Avalon gentleman", as he cautiously called Baltimore, "desires to take with him two or three brethren to sow the Sacred Faith in that land." Krugler, p. 89. ^ Codignola, p. 25; Stock conceived the Avalon colony as a base for conversion, lest the natives "become pernicious heretics" under the influence of Protestant settlers. Krugler, p. 89. ^ Aston died the following year in the siege of Île de Ré, opposite La Rochelle, in the service of George Villiers, 1st Duke of Buckingham. Codignola, p. 42. ^ He left his eldest son Cecil at home to supervise his lands and his affairs. Krugler, p. 95. ^ Browne, p. 19; Fiske, page 261. ^ The building was a two-storey longhouse, fifteen by forty-four feet, probably of stone, partly roofed with boards and partly with "sedge, flagges, and rushes"; it had a stone kitchen and chimney, a parlour, a two-room storehouse, a smithy, saltworks, brewhouse, henhouse, and tenements. Pope, p. 128. ^ Browne, p. 20; Fiske, p. 261. ^ Krugler, p. 97. Baltimore's tolerance went down no better with the Catholics: Propaganda banned Catholics from worshipping in the same house as "heretics", but in practice Baltimore's house in Ferryland was the only option for either denomination. Krugler, p. 98. ^ Browne, pp. 23–24; Fiske, p. 261; Codignola, p. 53; Baltimore thanked the king for "protecting me also against calumny and malice" of those who sought "to make me seem foule" in your eyes. Krugler, p. 100. ^ Codignola, p. 53; Browne, pp. 19–20. ^ Browne, p. 24; Fiske, p. 261. ^ a b Krugler, p. 102. ^ Letter to Wentworth. Krugler, p. 102. ^ a b Codignola, p. 54. ^ Browne, p. 27; Fiske, pp. 263–4; The Virginians may also have nursed unpleasant memories of Baltimore's membership of the Virginia Company board, when James I had revoked its original charter in 1624. Krugler, pp. 104–5. ^ a b Krugler, p. 107. ^ Browne, p. 31; Krugler, p. 118. ^ Englefield, Eric (1979). Flags. Ward Lock. p. 104. ^ Browne, p. 31; Fiske, pp. 265–266; Krugler, p. 118. ^ Browne, p. 32; Pope, p. 6. ^ a b Hennesey, pp. 36–45. Browne, William Hand (1890). George Calvert and Cecil Calvert: Barons Baltimore of Baltimore. New York: Dodd, Mead, and Company. Brugger, Robert J. (1988). 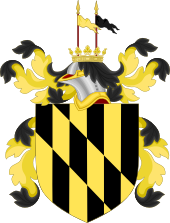 Maryland: A Middle Temperament, 1634–1980. Baltimore: Johns Hopkins Press. ISBN 0-8018-3399-X. Codignola, Luca (1988). The Coldest Harbour of the Land: Simon Stock and Lord Baltimore's Colony in Newfoundland, 1621–1649, Translated by Anita Weston. Kingston, Ontario: McGill-Queen's University Press. ISBN 0-7735-0540-7. Fiske, John (1897). Old Virginia and Her Neighbors. Boston: Houghton Mifflin. Hennesey, James (1981). American Catholics: A History of the Roman Catholic Community in the United States. Oxford University Press. ISBN 0-19-503268-3. Middleton, Richard (3rd ed. 2002). Colonial America: A History. 1565–1776. Oxford, UK; Malden, MA: Blackwell Publishers. ISBN 0-631-22141-7. Pope, Peter Edward (2004). Fish into Wine: the Newfoundland Plantation in the Seventeenth Century. Chapel Hill: Published for the Omohundro Institute of Early American History and Culture, Williamsburg, Virginia, by the University of North Carolina Press. ISBN 0-8078-2910-2. Stewart, Alan (2003). The Cradle King: A Life of James VI & I. London: Chatto & Windus. ISBN 0-7011-6984-2. Wikimedia Commons has media related to George Calvert, 1st Baron Baltimore. "Calvert I. George" . The American Cyclopædia. 3. 1879. pp. 629–630. "Baltimore, George Calvert, 1st Baron" . Encyclopædia Britannica. 3 (11th ed.). 1911. p. 287.